Like a Leo, the King of Wands is brave, generous, enthusiastic and dominant. He knows what he likes and isn't shy about going out and getting it. This card represents a mature man who is action oriented. He could be a fire sign: Aries, Leo, or Sagitarius. 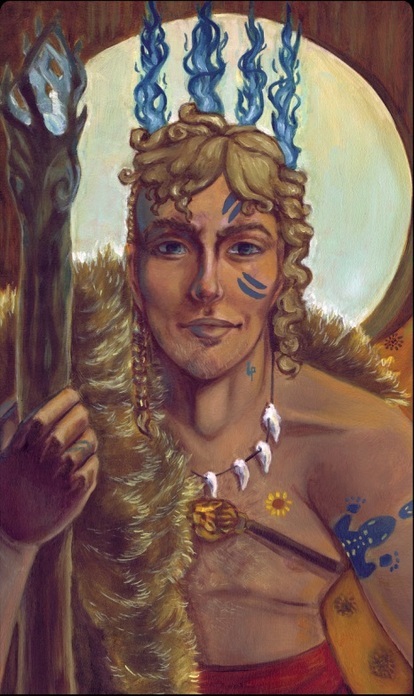 Below you can view the various artistic interpretations of the King of Wands card. This King represents active, masculine energy. He has ambition and determination to conquer the world and be a success. He is represented by a mature Swiss mountaineer, a hard-working farmer, and by a male lion protecting his family. Do you have a work-ethic that leads to success?